Noa Yekutieli’s 2012 exhibition, Baggage, at the Al Ha’tzuk Gallery in Netania, Israel, ruminates on physical and psychic notions carrying the weight of the past. In a variety of cut-paper installations, the exhibition examines the objects and memories each person accumulates and must carry from birth to death. 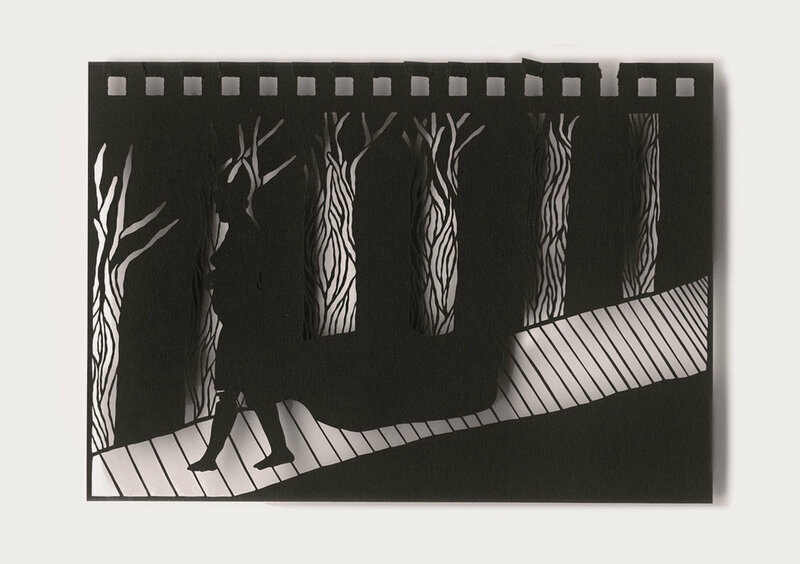 In a large installation of black screens women carrying weighty boxes walk across the landscape of negative space defined by the artist’s cut black frames. Looking through the frames, the images overlap within a singular field of vision, suggesting the shared histories of the women’s burdens and strength. A series of smaller paper-cut works line the circular gallery serving as metaphorical anecdotes expanding on memories carried as women are depicted moving monumental flowers across the paper frames. Mirroring the human desire for control, the paper cutting technique demands concentration and precision as well as a labor-induced effort that doesn't allow mistakes. The cutting the paper is an irreversible process emphasizing the temporality of the body and acceptance of death as a part of life and our common fate. In the center of the gallery a delicate black paper silhouette of a ladder, titled Elsewhere, reaches towards the gallery’s skylight, suggesting, though not promising, an escape from our heavy burdens. The ladder serves as a mirage of an opportunity to escape our shared fate. In a gallery two-dimensional framed works, piles of flowers and stones, symbols of burial, are placed alongside craters that represent the immortality of the materiality of matter. The various characters depicted in the exhibition are ultimately trapped between coping with and escaping their fate. They move, drag, and carry objects with them through the exhibition, elaborating the dichotomy between our desire to release and and the uneasiness of letting go.